The fleshy bud scale of the perennial herbaceous plant Lilium brownii F. E. Brown var. viridulum Baker, L. lancifolium Thunb., or L. pumilum DC. of family-Liliaceae. 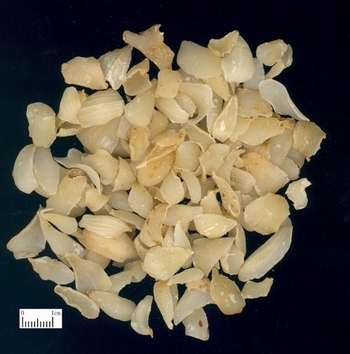 Cultivated in most areas in China. The bud scale of cultivated plant is big and slightly bitter, while the wind plant is small and bitter. Even, thick flesh, hard and white. Unprocessed or stir-baked with honey solution. Sweet, slightly cold; lung and heart meridians entered. Nourish yin of lung and heart, clear heat of lung and heart, relieve cough and dispel phlegm, calm heart and induce tranquilization. It is slightly cold in property with mild action. It can nourish lung yin, and clear lung heat. Though it is not strong than Bei Sha Shen, Mai Dong from moistening and clearing lung, it can relieve cough and dispel phlegm. For dryness in nose and throat, dry cough with little phlegm or blood in phlegm due to lung yin deficiency with dryness heat, fresh Bai He could be pounded singly, or it is combined with lung-moistening and cough-relieving herbs. For instance, it is used with Kuan Dong Hua in Bai Hua Gao from Ji Sheng Fang. For chronic cough, and cough blood due to lung deficiency, it is combined with herbs of nourishing yin, moistening and clearing lung, and dispelling phlegm. For instance, it is used with Sheng Di Huang, Mai Dong, Jie Geng and Chuan Bei Mu in Bai He Gu Jing Tang from Shen Zhai Yi Shu (Book from Shenzhai House). It can nourish heart yin, clear heart heat and calm heart and induce tranquilization. For absentmindedness, failure in self-controlling of emotion, bitter in mouth, dark-yellow urine, slight rapid pulse due to heart yin deficiency with heat, or deficiency restlessness, palpitation. insomnia and dream-disturbed sleep due to remaining heat in later stage of heat diseases, it is combined with yin-nourishing and heat-clearing herbs, for instance, it is used with Sheng Di Huang in Bai He Di Huang Tang and Zhi Mu in Bai He Zhi Mu Tang from Jin Kui Yao Lue. Decoct 10~30 g. Stir-baked with honey could strengthen its action of moistening lung and relieving cough.